When you connect your laptop to a projector, your display will be mirrored. What you show on the projector will be the same thing you see on your laptop’s display. You will not be able to use your laptop to display your speaker notes or outline. To connect a projector to your laptop, you will need a special VGA male-to-male connector. This connector has 15 pins on both ends and will plug into a 15-pin female connector on the back of your computer. Sometimes you may have to press a keyboard combination to display the contents of your screen using the projector. On most laptops this key combination is the Function Key (Fn) followed by F8 (the key should be marked, usually as CRT/LCD). You can cycle this key combination to switch your display from having it only on the laptop, to having it only on the projector, and finally to having it on both. Before you start a presentation, you may want to change your power settings so that your computer does not go to sleep in the middle of your presentation. This is done by accessing the Power Options applet in the Control Panel. Choose Start, Control Panel, then switch to Classic View by clicking on the link on the left. In Classic View, find the Power Options applet and click on it. 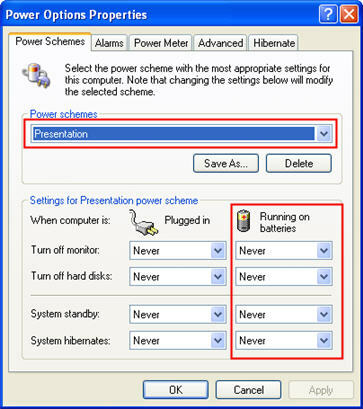 In the Power Schemes tab, make sure the Power scheme is set to either Presentation or Always On. If you are going to be running your computer using only the battery as a power source, make sure the options under Running on batteries are all set to either Never or to a time that is longer than your presentation. This will prevent your computer from going to sleep in the middle of your presentation if there is a long pause where your computer is not being used.